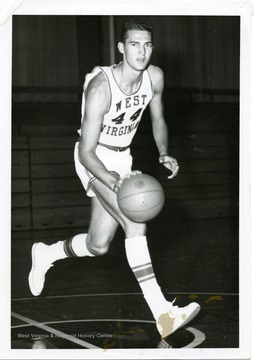 West was an outstanding player for the Mountaineers and is a member of Pro Basketball's Hall of Fame. 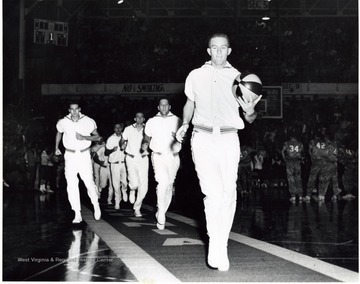 Willie Akers leads the team down the carpet and Jerry West is on the left. The carpet is rolled out before each home game for the WVU team to enter on to the court. This is one of the best traditions in NCAA basketball. 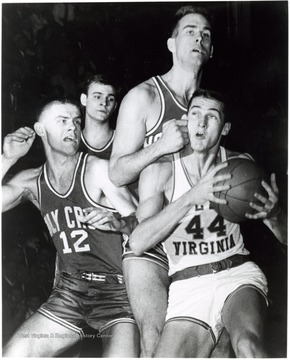 6' 3", 175- pound Jerry West battles 6-7, 230 pound Jeff Cohen for the rebound in Southern Conference tournament action. 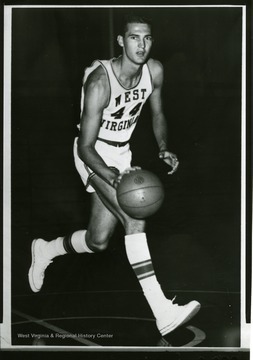 The Mountaineers, finalists in NCAA play, had a tough time squeezing past William & Mary in their conference semi-final, 85-82, as West scored 38 points. 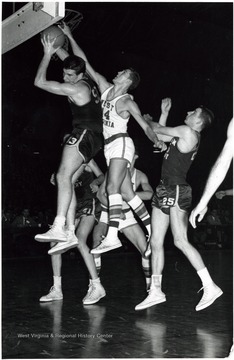 Jerry West is fouled by Ralph Brandt in attempting a lay- up against Holy Cross. 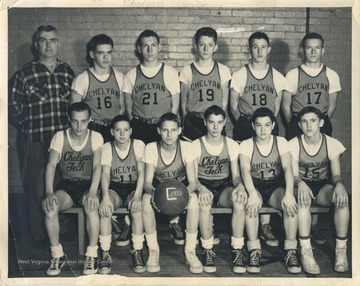 Number 12 is George Blaney. 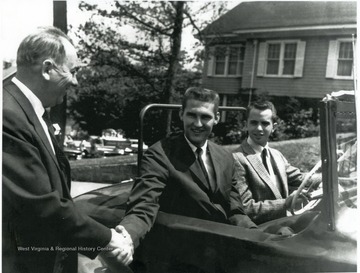 The photograph was taken while West was driven through the streets of Beckley by a very proud fan following West Virginia University's amazing run in the 1959 NCAA Basketball Tournament. The Mountaineers make it to the National Championship game, losing to California by one point. 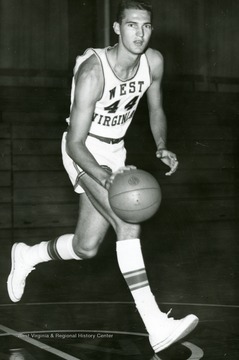 West was named the MVP of the tournament. The others in the photograph are not identified. 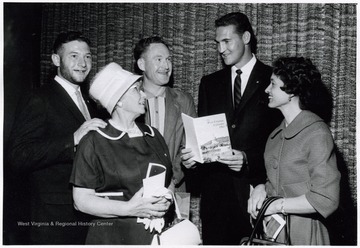 A photograph of Jerry West (second from right) standing with Louise Larkey (right) and Victor Larkey (far left) of Weirton, W. Va., Mrs. O. J. 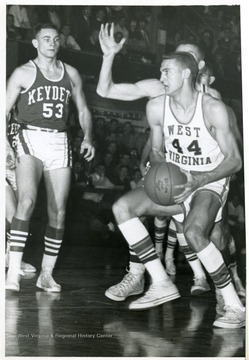 White (front left) of Morgantown, W. Va., and Red Lyons (rear right) of Raleigh County, W. Va.
West, who is holding the ball, attended Chelyan Junior High before attending East Bank High School. West, No. 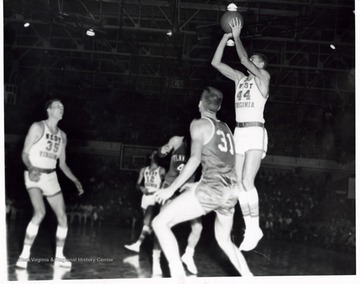 44, played for the Los Angeles Lakers basketball team from 1960 to 1974. 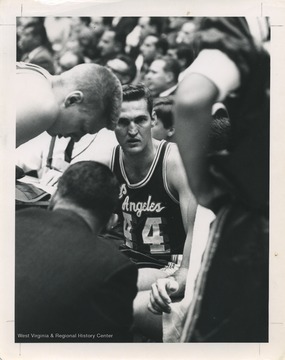 He was an All-Star every year of his career and led Los Angeles to the NBA Finals nine times.